« Can Surface Pro 2 be a true notebook replacement? The key to removing persistent drivers is in checking the “Force Deletion” box below the Delete Package button. 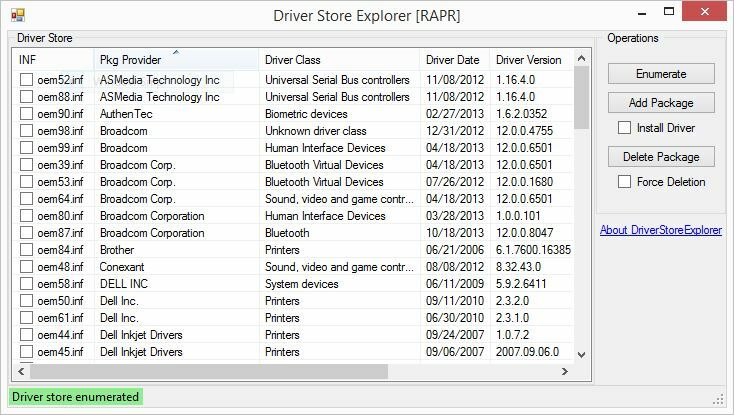 Only by checking the boxes to the left of the two Dell Inkjet Drivers entries shown (oem44.inf and oem45.inf), and then checking the “Force Deletion” box beneath the Delete Package button in RAPR was I able to make these pesky and persistent printer drivers disappear from my Windows PCs. This technique works for any such persistent drivers that otherwise resist removal, but you’d better be darn sure that you don’t need those drivers (or can find them again) should their return ever be mandated. To ease any concerns you might have in restoring them, you can first use the right-click “Export” option in RAPR to make backup copies in another directory of your choosing, before getting rid of them. I had no such concerns for the inkjet drivers, because I have replaced that printer with a very nice Dell 2155 cn color laser printer, whose drivers you see already resident in the foregoing RAPR display as well.